Whether you’re hoping for a last-minute getaway, a summer retreat or you’re planning a special holiday next year, that old adage – variety is the spice of life – has never been so apt. While it’s true that the most popular holiday locations such as Spain, Portugal and Greece can also be the most affordable, sometimes we all need to try something a little different. Santorini offers one of the most beautiful places to see a sunrise in this world. How different depends on you and those you are travelling with. Perhaps you’ve decided to ditch the summer beach break in favour of a winter holiday on the slopes. Maybe you’re vying for your first every city break. Or perhaps you’re going al fresco this year, stopping in a sunny French campsite or hiring a motor home to really get out and explore. One option that certainly comes under the ‘seriously special’ banner is a Santorini vacation. Home to steep rugged cliffs, blue-domed churches, sugar-cube houses and dramatic coastal scenery, Santorini will delight even the most seasoned of travellers. Some towns are only accessible on foot, bike or by donkey, so a trip here is like taking a step back in time. 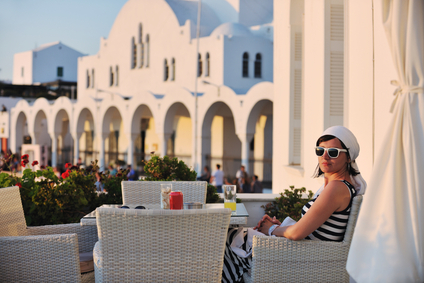 Others are a little more acquainted to modern living with contemporary hotels, chic wine bars and cosy cafés. Streets of Oia, the oldest settlement of Santorini. Whether you choose Santorini or any one of the other many, many different destinations and holiday options available, there’s certainly somewhere special out there with your name on it.